Josh Taylor confirmed what every boxing fan has known for a very long time. 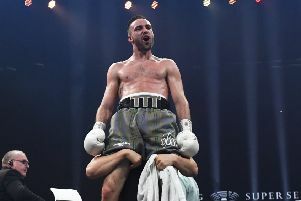 on Saturday night, the Scot making a second successful defence of his WBC Silver super lightweight title, one journalist took the opportunity to ask the 27-year-old how he makes the professional ranks look so easy. His response was, as expected, taken in jest, but that didn’t stop those who had gathered nodding in agreement with the Edinburgh fighter’s humour. Former WBA featherweight champion McGuigan has never been one to shirk the opportunity to shower the 2014 Commonwealth medallist with praise. However, Taylor’s latest victory, the 12th of his professional career, has now moved him to within touching distance of a maiden shot of his first world title. “Josh is one of the best fighters in the world, not just in the super lightweight division but any division,” McGuigan said. “The super lightweight division is red hot at the moment but he’s the hottest thing in it. We’re now very close to something really exciting. He’s very special. I am accused of being biased but I said at the very beginning how much talent this kid has. They all said he couldn’t punch as an amateur – well how silly do those people look now? believe he will win the world super lightweight title and then move up to welterweight. But it’s just about taking one fight at a time. Meanwhile, Edinburgh’s Jason Easton suffered the first defeat of his professional career as he was stopped late in the 11th round by Englishman Glenn Foot. However, there was greater concern over the IBO Intercontinental and Celtic super lightweight champion’s health after ringside paramedics rushed to assist Easton, who lay stricken on the canvas. After receiving some oxygen, the 26-year-old was able to return to his feet but was inconsolable as he left the arena. Easton spent Saturday night in hospital under observation but was released yesterday. Easton was never in the contest and looked a fraction of the boxer who had reeled off 11 straight wins. Foot’s celebrations were scaled down given the way the contest ended but he is the new Commonwealth champion. There was a third straight win by knockout for the capital’s Lee McGregor, while Charlie Flynn’s Celtic Lightweight duel with Ryan Collins was declared a technical draw after a clash of heads in the third round. Marc Kerr defeated Iain Trotter to become the new Scottish middleweight champion.